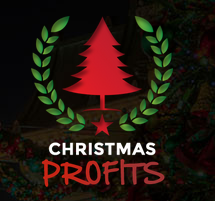 Christmas Profits Review – Scam Or Legit? This is yet another binary options system, I can’t believe just how popular these systems are lately it’s all that seems to be getting launched! Now if you frequent on this blog you’ll know I don’t really like binary options systems, but is Christmas Profits going to bring something new to the table? Is this finally the system that’s going to allow us to actually make some money? I hope so… It’s about time I found one! 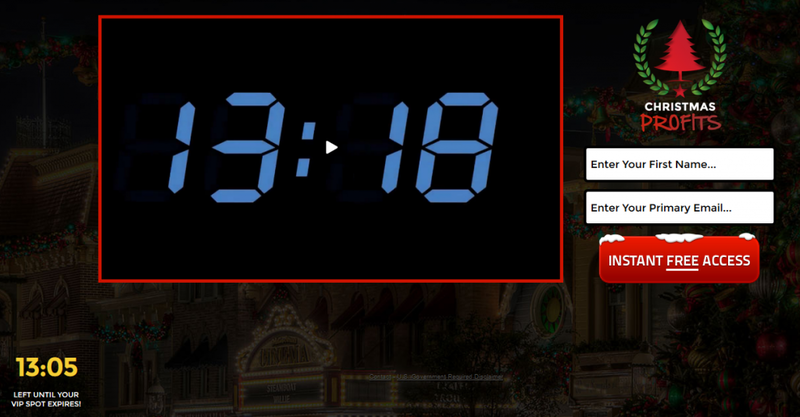 I decided to watch the video to the end & funnily enough my spot didn’t “expire”. Hey, you can’t blame them for trying though! That doesn’t neccessarily mean it’s a scam – often a lot of companies use this technique to try & get people through the door. However it’s not a technique I’m a great fan off because it often rushes people into a decision and doesn’t give people chance to research more information. This means people sign up for a product they don’t really understand. But, I’m guesing since you’re reading this page you decided to go ahead & do your research anyway – good on you! The system itself is free & it claims that hundreds have paid thousands of dollars for it in the past but it’s certainly not something I’ve ever heard of before & I did some research but couldn’t find evidence that it had been available for sale anywhere previously. The system itself says that it’s practically guaranted to make you money. Now don’t get me wrong, it could be a great system but when it comes to binary options absolutely nothing is certain – that’s why I’ve never been a big fan of them. You have about as much chance of making money with binary options as you do walking into a betting shop and placing your money on roulette, that is unless you’re doing an awful lot of research into your trades. It’s certainly not easy and I find it very difficult to believe that a free piece of software could automate this task & pretty much guarantee you a return… everybody would be doing it right? In the video he claims to have started out with $350 in his broker account which he claimed to turn into $8,741 “in about an hour”. He didn’t make the $8,741 directly from the $350, he ran a couple of trades and I’m guessing he was putting the full amount of his winnings back on another trade in order to make the money. That’s fine, and by doing that you could of course make an awful lot of money – but you coud lose a lot too. Before he got to the $8,741 he had $3,000 in his account so I’m guessing all this was put on 1 trade. If that 1 trade went wrong then that would have been $3,000 lost… not good at all! Remember this system is only practically guaranteed, so anything could happen. What happens when you sign up? Once you enter your name & email on the main page you’re taken to another page where you’re then asked for your name, email, a password & your phone number. On this page there’s a video that says “I’m not going to ask you for any money or pitch you any junky programs… free means free”. However, about 15 seconds after it says that you’re told that you have to open a trading account with the broker they recommend. I guess though this was going to be an obvious requirement from the start since that it’s binary options, you’re bound to need some money to invest to test the system out. What I want to bring to your attention though is the fact that the owners of Christmas Profits will get a commission when you go ahead & sign up with the broker. Unfortunately it didn’t show you the system or give you a preview of how it worked without you depositing over at the broker so I couldn’t continue any further on than this & I can’t comment on the system itself. I have tried searching the web for reviews written by people that have used the system but I couldn’t find any just yet, I’ll be sure to update this page as soon as I manage to find some. Despite me not being able to give any insight on the system itself I hope I’ve given you a better insight into the binary options market. Personally I’d recommend avoiding binary options because as I mentioned above it’s nothing more than a gamble. If you really want to make money online then you should invest your money in something proper like internet marketing, that way you can make real money & scale your earnings as much as you want. I hope you enjoyed reading my review & if you’ve tried this system then I’d love to hear your thoughts & most of all how it worked out for you. You can leave a comment below this post & it’ll not only help me but it’ll help anybody else that’s reading this post & considering trying out Christmas Profits for themselves. Speaking of Christmas it’s only a week away, it’s soon come around! If you do happen to try this system hopefully it pays off for you & makes for a good Christmas! It’d be a bit of a bummer losing money over the festive period. FB Freedom System Looks Like A Scam To Me! Nuvo Finance Review – Total Scam or Trustworthy System? I'm Dale Rodgers, a former electrician that discovered how to make a full time income online. I've put this blog together to share what I've learned so that I can help others do the same. Read more about me here. One Response to "Christmas Profits Review – Scam Or Legit?" I tried the christmas profits system and it is a scam. I deposited $250 did 4 manual trades won two and lost two. I was never able to get the automated system to work. So I contacted customer service and the only people that called me back were trying to get me to deposit more money. After days of trying to get someone to help me with the auto trades and only receiving calls from people who wanted me to add more money, I suspected that I fell for a scam. Then I noticed that there is no withdrawal button on the software only a button to fund your account. Plus, they didn’t ask for any personal verification or tax info. I still have access to the system where I have $240 sitting but cannot withdraw it. I will be happy to send a screen shot. Please note that comments lacking value or containing obscene language it will not be approved. I’m Dale Rodgers, a former electrician from England (UK) that discovered how to make money online. The internet helped me quit my job & I want to share what I’ve learned to help others do the same. ...or drop me a message here. Amazing Rapid Cash Review – Scam or Legit System For Making $1,000/Day?